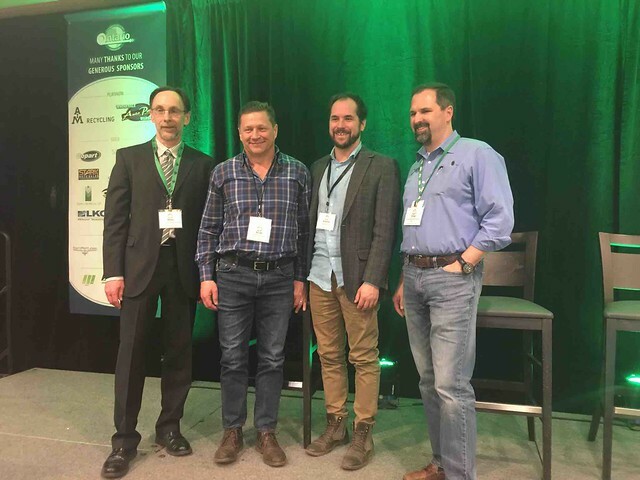 Toronto, Ontario – March 29, 2019 – On Friday, more than 370 auto recycling industry stakeholders gathered from across North America for the Ontario Auto Recycling Association Convention and Tradeshow. The event was held at the Mississauga/Meadowvale Hilton Hotel. Over the course of the two-day event, guests listened to presentations and panels from 18 speakers. The tradeshow portion of the event opened on Friday afternoon, bringing with it representatives from more than 50 businesses. In his opening speech, OARA executive director Steve Fletcher opened the show with an address that touched on the resilience of Ontario's recycling community and his pride in OARA's work with regulators. The sentiment was echoed by keynote speaker Dan Marks, the visionary fourth-generation recycler whose marketing successes have helped fuel his Buffalo-based facility to new heights. "Not to go all Trump on you here," Marks said, but "Let's make the industry great again." Marks went on to advise recyclers to consider new embracing new opportunities to overcome challenges like forming brokered parts networks. "The reason I love this business is that there is always a way to pivot the business model." During a panel discussion that followed, Scott Robertson, Chad Counselman and Andrew MacDonald backed up Marks's call for recyclers to embrace new techniques. "By joining a brokered parts networks, my business went from having a matching part for 42 percent of searches to 90 percent," Counselman said. During a presentation from the Ontario Ministry of the Environment, Conservation, and Parks, officials presented statistics about the number of facility inspections visited during the 2018 fiscal year. According to the presentation, more than 400 facility inspections had been conducted, about as many as the previous year. During the question and answer session that followed, the presenters were challenged by a number of recyclers concerned about the differences between the length of time spent on inspections. "Some inspections seem to be taking 20 minutes, others go on for two hours," one audience member said. "Is there a reason the inspections aren't consistent?" In response, the ministry representatives said that some inspections could take more time if the ministry had received information indicating particular concerns. Current OARA treasurer, Mary Poirier of Valley Automotive, also questioned Ministry officials about a particular case she had been following for more than three years. "This facility was called to your attention three years ago, but it still operating and not on the EASR registry," said Mary Poirier "I'd like to know what is taking so long." While the Ministry's officials declined to comment on the particular case, they did say that it was possible that the facility faced environmental concerns that, while not sufficient to require immediate closure, prevented the facility from being registered. OARA has been the voice of the auto recycling industry in Ontario since 1992. OARA has kept Auto Recyclers and other industry stakeholders informed and involved with input and information into current industry trends and government legislative initiatives that affect the auto recycling industry. A full breakdown of the big moments at OARA's 2019 convention and tradeshow will be available later this week.